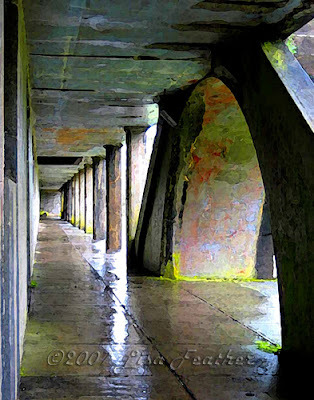 This image is another from a hike along the Cape Horn Loop Trail in the Columbia River Gorge. What makes this image so amazing is the light. It captures the morning sunshine breaking through the branches of the trees, pushing aside their veiling limbs and illuminating the sheltered foliage beneath. You can actually see the rays of sunlight painting their soft colors across the woodland branches in the heavy morning air. You can also see the mantle of color emanating from the sun itself. This view was captured along the Cape Horn Loop Trail in the Columbia River Gorge. This image highlights the angle of the hillside and the beautiful morning light asserting itself through the branches of the trees and illuminating the rich foliage beneath. The lines in this image are interesting and the eager leaves of the ground foliage radiate a brilliant green. Still the sun itself is the star of this image. The rainbow of light in the sunbeams streaming through the tree trunks radiate joy and kiss the scene with energy and hope. This photo was taken beneath the aquaduct at Nanzenji temple in Kyoto. The scene through the echoing arches changed rapidly as tourists passed through examining the construction, taking photos or resting briefly in the shade. 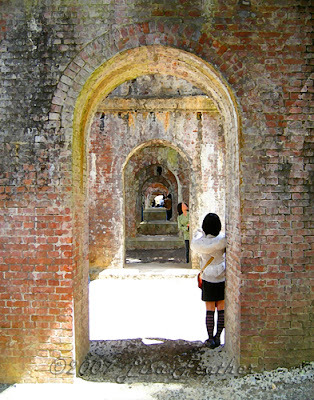 I felt the arches invited a deepening understanding of the experience of travel. Each arch was a gateway to a new point of reference on the same elements, brick and mortar, light and shadow, the effect of age on the beauty of all that exists in this world. Each archway is the same in many ways and yet offers a slightly different perspective. Each individual visiting the site is also a part of that dynamic pallette, adding their own unique imprint on my travel experience, their own form and color to the image captured. 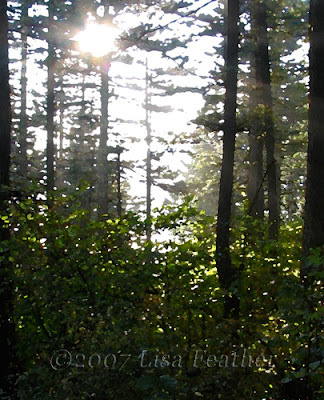 This image began as a photo taken on the Cape Horn Loop Trail in the Columbia River Gorge. 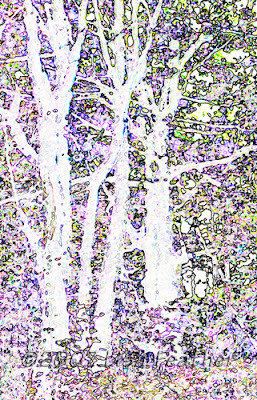 The trees and the light in this image suggested such amazing personality. I worked with the photo, one iteration leading me to another, until I finally settled on this unusual treatment to convey the wonder inspired by this image. This scene is resplendent with seasonal color and suggests the inspiring attributes of a hike through a rich landscape on a beautiful autumn day. The woods are astonishing in their rich detail, the depth of line, of shadow and shade, and the way the light plays with each element from any particular viewpoint. Sometimes all you have to do to capture a really great image is step outside your own back door. I found this maple leaf in my backyard, on the shoe stone between my deck and my back lawn. 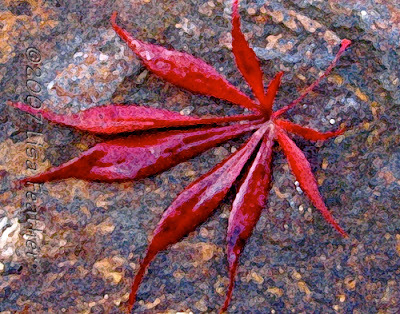 It had turned a marvelous shade of crimson and its brilliance seemed to coax the russet tones from the slate in the rock that had been placed as a stepping stone into our garden. In its final form, this image is one of my favorites. Its simplicity is inspiring as it highlights the astounding beauty of nature that surrounds us every day and is ours to enjoy if we will only open our eyes and really see. We needn't look far at all to have something to marvel at. The beauty of creation is just outside our own back door. This unique image was captured in a small interior garden in the Naramachi Lattice House in Nara, Japan. 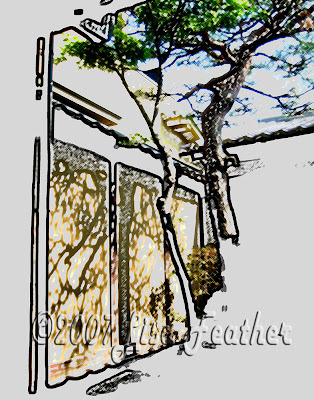 The shadows of the beautiful tree in the morning light fell gracefully across the solid wall at the edge of the garden. The effect was one of golden lace spun against a simple screen. As I worked with the image I stripped away the areas veiled in the shadow of the house and highlighted the play of light and shadow falling through the branches of the carefully trimmed trees. In this way I hoped to draw attention to the intentional beauty captured by the garden designer's foresight and planning. Like any great work of art, the changing display of shadows framed on this garden wall was a joy to behold. This view of the Astoria-Megler Bridge was captured outside the Cannery Pier Hotel in Astoria, OR. The Astoria-Megler Bridge is an impressive and formidable structure. it traverses the mouth of the Columbia River and is 4.1 miles wide. 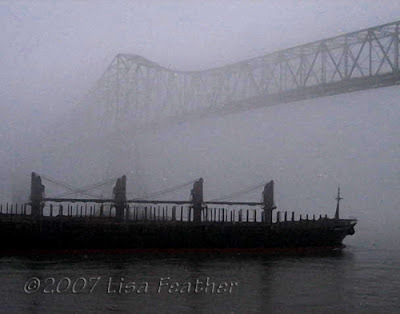 On many a gray day in the Pacific Northwest it stretches from the river bank in Astoria, OR to an unseen shore. As I studied this bridge one spring weekend I tried in vain to see the whole bridge but the other side remained veiled in gray mist. 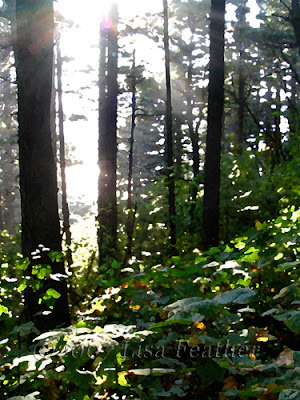 This is another image from the garden of The Inn of the White Salmon. 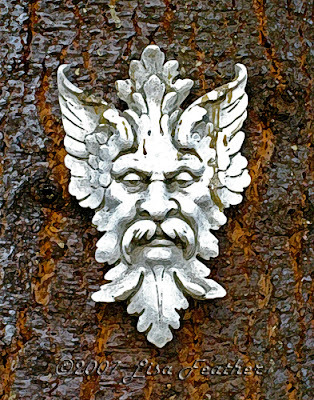 This garden face was found on a tree near one of the doors to the back garden. I liked the face and the way it brought out the beauty and texture of the bark on the tree. I also liked the way it seemed in be in keeping with the antique charm of the Inn. While working with the photo, as I enhanced the detail and color of the tree's bark, the face seemed to both contrast with and yet blend into the scene even more. The shadow and highlight of the garden sculpture seem to echo the character of the bark in an interesting and sympathetic way. Last autumn, one lovely sunny weekend, I stayed at The Inn of the White Salmon in the Columbia River Gorge. 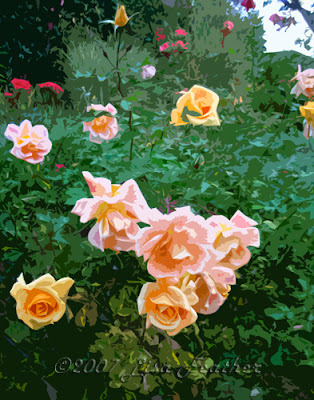 Early the next morning, before breakfast, I found these beautiful roses blooming in the garden behind the Inn. While autumn was in the air and the leaves on the trees around the garden were brilliant yellow and russet orange these roses reminisced about the splendor of a summer garden. Still sporting tightly closed buds these fragrant flowers enticed me to spend a few quiet moments alone in a beautiful garden capturing the beauty of both summer and fall before the gray days of late autumn settled firmly over the Pacific Northwest. The image captured here is of a sunny bouquet of herbs from my garden. It includes an abundance of lemon sage, flowering oregano, and sprigs of mint. 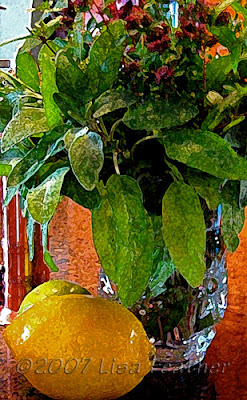 I loved the shape and soft texture of the leaves in this summery bouquet as well as the gleam of the small glass pitcher the herbs are gathered in. In working with this image I tried to bring out the bright details and enhance the casual charm of this arrangement. The way the texture of the leaves came to life was especially rewarding. The result is so inviting I can almost smell and taste the fragrant herbs captured in this image. 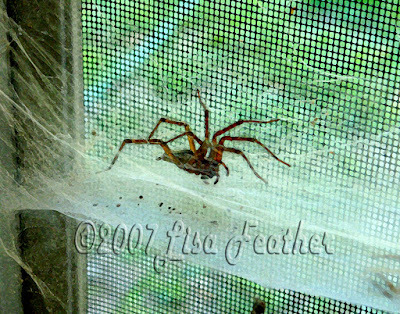 The image of this spider was captured in the Lower Town Arts District in Paducah, Ky. This spider was spinning its own exhibit between the glass and the screen of a window at The Stranded Cow cafe. I thought the color, form and geometry captured was stunning. The gauzy web is visually spectacular and the spider's body is almost translucent in the light. Beyond the spider's web and the grid of the window screen, the brightly muted pastels of a Kentucky landscape offer a luscious backdrop to this portrait of one of God's truly amazing creatures. This image was captured in Astoria, OR. 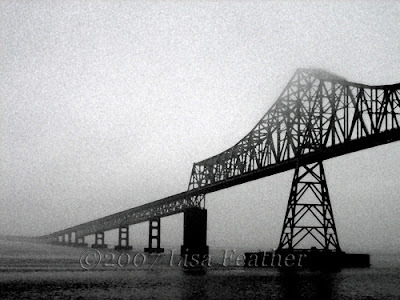 I spent hours there last spring gazing out a window at the fog veiled expanse of the Astoria-Megler Bridge. I took many photos of the bridge. As ships passed I took even more photos. This image is memorable for its gray on gray subtlety. From the bridge fading into the distance to the subdued reflections on the water this image possesses a quiet beauty. This photo was taken in Hibiya Park in Tokyo. 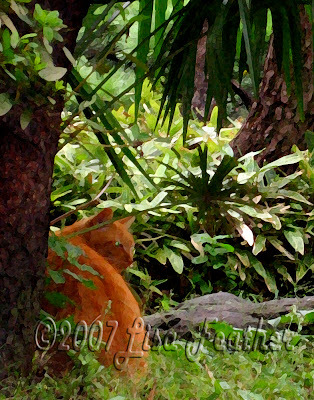 This cat was sitting under a beautiful tree surrounded by lush foliage. The contrast of his form nestled against the bark of the tree in this garden landscape was striking. 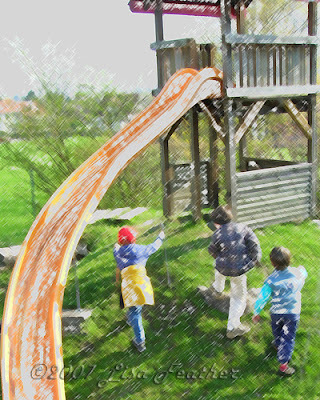 This image of young school children is based on a photo taken on a playground in Switzerland. The photo was full of bright colors and childlike wonder. The amazing light and long shadows add to the playfulness of the scene. This image is based on a photo taken during a family vacation in Switzerland. We spent the day riding a train from Zurich to Lausanne. On the way we stopped in Bern for several hours. Bern is a beautiful place to visit. 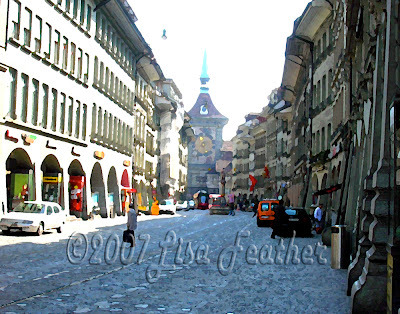 We walked past fountains, the Parliament building, quaint shops and flower stalls before we approached the Zytglogge-turm, Bern's famous clock tower near the apartment where Einstein once lived, and a short walk from the scenic Nydegg Bridge. The setting was magical in the morning light. This image captures the fresh charm of this marvelous city. In September I spent a day on my own in Tokyo. I had a wonderful time exploring the city, walking through Ueno Park, visiting the Shitamachi Museum, exploring Ameyayokocho, and soaking up the atmosphere of Senso-ji Temple. At one point during the day I found myself on a train with many men in business suits carrying briefcases. I looked out the window and took random photos. 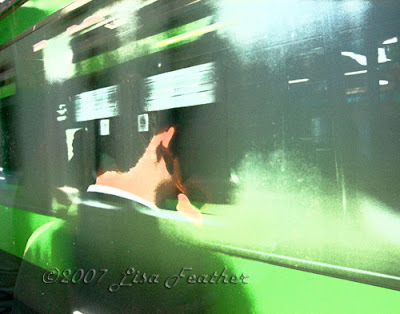 One image in the series captured this reflection of a businessman talking on a cell phone as another train goes by outside the window. All we see in this view is a ghostly image of the back of his head as another train flies by in the opposite direction. This stunning capture of Mt. Adams was taken from the glacier ridge at the summit of Mt. 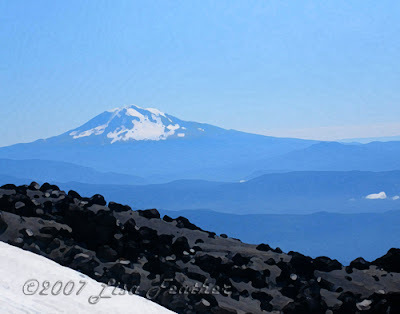 St. Helens in July 2007. My eye was attracted to the alignment in the contours of glacier, lava rock, ridges and finally Mt. Adams in the distance. The simplicity and artful symmetry of nature shines through from this perspective.